I started by installing the YUICompressor .NET (MsBuild Task) package from Nuget gallary in my VS2010 web project. 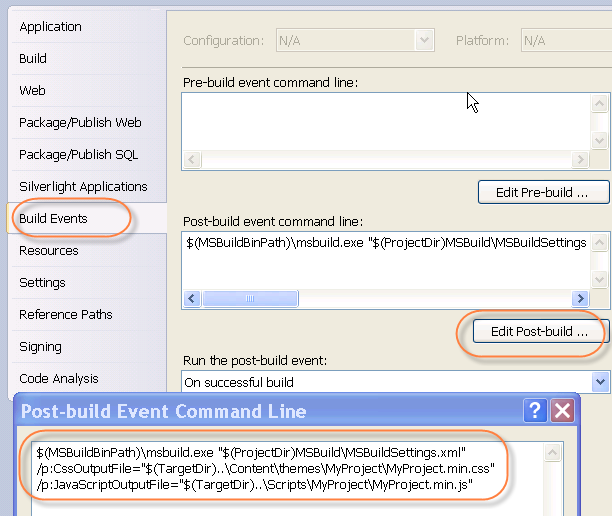 Download the Sample WebSite using Post-Build events. Copy the MSBuild folder to your project root. Open MSBuildSettings.xml (inside the MSBuild folder in your project) and modify the element UsingTask‘s attribute AssemblyFile to AssemblyFile="(root folder for your solution)\packages\YUICompressor.NET-MsBuild-Task.1.6.0.1\lib\NET35\Yahoo.Yui.Compressor.MsBuildTask.dll". Also modify the path and the final file name for CSS and JS output. Click the image below to see the code. $(TargetDir) <– you might wish to change this if you have another destination directory. clever work and exposure! Keep up the good works guys I’ve incorporated you guys to my own blogroll. I’ll bookmark your weblog and check again here frequently. I’m quite certain I’ll learn a lot of new stuff right here! Best of luck for the next! Hello! I could have sworn I’ve been to this blog before but after looking at a few of the articles I realized it’s new to me.